So, how do I comment on the SGEIS? This entry was posted in Barnard College, Energy, Policy on November 23, 2011 by Lindsay Garten. While the comment period on the Supplemental Generic Environmental Impact Statement (SGEIS) and draft fracking regulations, ends on Dec. 12, there is still time to comment and have your voice heard. If you feel that you cannot make a comment on the SGEIS or the draft fracking regulations, there is still the opportunity to attend a public hearing on fracking. While there are only two more hearings left, these hearings are a great way to learn more about the issues and voice your opinion. The New York State Department of Environmental Conservation (DEC) is required to read all of the comments they receive, you’re allowed to comment more than once but most comment before Dec. 12. While these two documents are extremely lengthy, environmental organizations that have read over both documents, such as Riverkeeper and the Sierra Club, have filed detailed comments. For guidelines on what to comment on, here is a document that details the top ten problems with fracking: ‘Top 10’ flaws with the fracking environmental impact statement. Mail your comments to Attn: dSGEIS Comments, New York State Department of Environmental Conservation, 625 Broadway, Albany, NY 12233-6510. Include your name, address, and affiliation (if any). Submit your comments online: If you prefer to comment online, visithttp://www.dec.ny.gov/energy/76838.html. This entry was posted in Climate, CO2, Deforestation, Energy, Green living, Sustainable development and tagged Conscious Consumption, Corporate Action, Profiting from Sustainability on November 22, 2011 by Katheryn Thayer. This year, McDonalds will expand its international chain with over 1,100 new locations. And this is great news for the environment. Surprising? Many ecologically aware eaters talk about small and local initiatives: independent farms, CSA produce boxes, and farmers’ markets. But large-scale environmental benefits can be achieved through changing our existing, large-scale food system. Without a doubt, the dialogue started by the sustainable food movement has had an influence on how McDonald’s presents itself. At least some of the initiatives McDonalds has taken towards sustainability are there to appease societal demands that corporations have a conscience. McDonald’s website offers emotional video clips about how the company supports the Global Conference on Sustainable Beef, Sustainable Fisheries Partnership, Food Animal Initiative, funding research on how to make commercial scale agriculture sustainable, and the Round Table on Sustainable Palm Oil, looking for sustainable approaches to an industry that has contributed to deforestation in Malaysia. In a world of greenwashing, corporations’ environmental initiatives come across as insincere, self-serving marketing tools. But when it comes to large-scale business sustainability, there is more than just marketing at play: sustainable choices to reduce consumption and waste are also easy ways to cut costs, creating a strong, profit-based commitment to wiser use of resources. And a company as large as McDonalds can institute changes that have wide-reaching influence. As Joshua Brau, a Yale Business School student who has worked with McDonald’s explains, “Shareholders typically have a single concern: maximizing returns. And these companies see there is a substantial business case for reducing environmental impact,” going on to say that, at McDonald’s, “the sincere interest in doing good is in line with company objectives. Less energy consumed and higher efficiency translates to increased profits”. In McDonalds restaurants, LED lights and efficient fryer fireups save energy, and sustainable building practices are being incorporated into new locations. 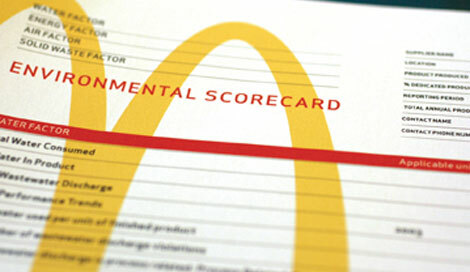 When purchasing from suppliers, McDonalds uses a Supplier Environmental Scorecard to measure packaging waste, maximize recycled materials, and reduce greenhouse gas emissions. Using this index, companies that produce food for McDonalds, such as East Belt Bakery, were able to improve their input to output ratios– making food more efficiently and saving money in the process. Pleased with the results, East Belt introduced this index to the North American Bakery Council and helped 50-60 similarly large bakeries use less energy and resources in production. In 2007, the Australian Food Company, a supplier to McDonalds, cut their water use 30% through practices such as rainwater collection and new cleaning systems as suggested by the Environmental Scorecard. And in Canada, suppliers using the scorecard cut water use 56%, energy consumption 67% and waste production 67% between 2005 and 2006. Good environmental choices are often good business choices, and companies as large as McDonald’s have huge environmental impact when they make money-saving changes. As McDonald’s VP of Corporate Social Responsibility Bob Langert explains in an interview on Daily Finance, “We as a company spend $1.7 billion on energy around the world. Energy efficiency can cut that cost. The other big issue is waste. That includes packaging that turns into waste and other waste in general. We spend $1.3 billion on processing waste. So reducing our packaging and figuring out ways to divert waste will be necessary and help our bottom line. It’s the right thing to do, but its also business related”. These figures beg the question of how genuine environmental intentions must be: is sustainability at McDonald’s of a lesser value because it self-serving? Does sustainability have to be a grassroots initiative? The reality is that environmentalism has been ignored for too long, in part because the private sector views it as a financial burden. 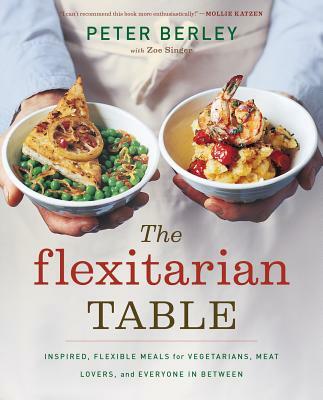 By equating wise use with profit maximization, an environmental consideration of how we eat can reach a wider eating public. Environmental eaters should promote and patronize farmers’ markets and co-ops, but also applaud the corporate sustainability measures, even if incidental, that are creating a large-scale norm of efficiency and ecological consciousness. 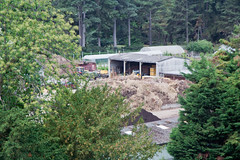 This entry was posted in Developing world, Energy, Policy, Toxins on October 19, 2011 by sth2114. Why must you take everything for oil? This week I am going to take you to Consuelo and El Arbolito Peten, Guatemala. A place that was once highly populated with indigenous populations now remains a ghost town with little communities left. Entire populations were ravished of their lands after the discovery of nickel and oil in the area in 1976. Before this no one paid much attention to these communities. They were referred to as the “selva” or in English “the jungle”. The selva was a place where the uncivilized Garifuna and Maya indigenous communities lived, now it is dominated by oil reserves. Guatemala is located on an old geological belt where 75% of the world’s oil reserves can be found. In 1981 President Lucas Garcia announced that the government had granted permission to allow the extraction of 8,000 barrels per day. A 10-inch pipeline was built eastward to the Atlantic coast, which transports the oil. In the first six months Guatemala oil exports totaled 390,000 barrels. Oil reserves in Guatemala have been compared to those of Alaska. According to Oil watch Mesoamerica, Guatemala is a place where there are a poorly hidden black markets for buying and selling oil. The oil companies that established themselves in Guatemala include Guatemala Limited, Compañía General de Combustibles, Petro Latina Guatemala Corp. (Peten) and Petro Energy S.A, all work under complimentary conditions. These oil companies have very little environmental or governmental regulation. Perenco, is an independent Anglo-French oil and gas company with a headquarters in London. This company has greatly distinguishes itself from the rest of the group, with policies that upholds an environmental friendly business that focuses on sustainable development. As quoted directly from Perenco website “wherever we operate, every effort is made to improve the quality of life while preserving traditional cultures and values”. However, what they forgot to include is the fact that they support their own monopoly by owning 98% of the concessions in Guatemala, they have widespread political power, and have participated in oil and cultural genocide in the western part of Petén. Induced by a plan to start oil development and in the process wipe out indigenous populations in the way. Does this seem environmental friendly to you? To date there has been more that 70,000 Guatemalans who seek asylum in Mexico and other part of Central America. This was the after the Guatemalan government’s plan to develop the country in 1976, involved indigenous people being kicked off of their of their land. After oil was discovered in their areas, land values significantly increased. Not only because of the oil, but because an infrastructure of roads (most importantly the main east/west road), communication networks, and hydroelectric power plants have connected this one-time impenetrable area to the rest of the country. In addition a $30 million airport, all became apart of the governments plan. However, many places like the indigenous in Peten stood in the way by refusing to give up their land to oil companies. Instead they were handled with force by the Guatemalan military, which were backed by oil companies and recieved $85 million dollars of militant support from the United States. The objective was to use fear tactics or do whatever necessary to occupy the territory. Many indigenous people were tortured and even killed by the military. Over 1,901 people from 19 communities had sought refuge in Mexico after battling the dense jungle and crossing the Usumacinta River, which separates the countries. They left their homes and life behind them. The government got what they wanted and as the people fled oil production began. Today the indigenous communities continue to battle with oil companies. Recently, in September 2010. Perenco condemned the lack of consultation with the 37 settlements located in Laguna del Tigre about Perenco’s extension, a procedure that is called for by Convention 169 of the International Labor Organization (ILO). Perenco’s plans consist of extending oil refines and having their own protected pieces of land. Most of the land Perenco wants is called Laguna del Tigre, which is the home to many indigenous and peasant populations. The oil company has already paid off the government officials to evict the people from their homes. Perenco argument is that they have a right to evict these communities, which are in protected areas that they own. The indigenous communities refuse to go and claim that “the government established the Protected Areas law—without informing nor consulting us.” “Now we are not even allowed to participate as a population, or even just communities, in the administration and development of these protected areas, something, which the same law is supposed to allow for. The only option it gives us is to abandon our land.” This is proof of Pereco’s political abilities to sway the government in getting what they want. The Guatemalans in Laguna del Tigre are aware that standing their ground comes with a price. Countless of the bloody deeds have already been carried out by “Perenco’s hit men”—as Robert Arias called them in 2006 in his La Hora column, after the murder of Mayco Jonatán García—against those who have denounced the company. The oil companies always wins and still many indigenous people remain displaced from the land that their people have owned for centuries. For Guatemala cultural genocide is a reality of the past and it continues to haunt them in the future. In Guatemala there is a saying “el petróleo es como sangre”. This mean is oil is the same as blood. This entry was posted in Barnard College, Energy, Policy, Toxins on October 19, 2011 by Lindsay Garten. 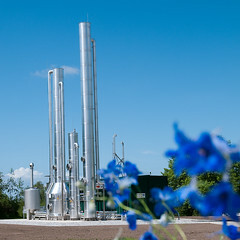 Although hydrofracking has proven to be a controversial issue, New York State is undergoing the process to legalize it. As a result, the state must regulate the new industry. The way in which New York is engaging in this process is being criticized and opposed by a number of environmental organizations. One such group is Riverkeeper; founded in 1966, Riverkeeper advocates for clean water in New York City. While hydrofracking itself is controversial, the process under which New York is considering it has also proven contentious. On July 1, New York Governor Andrew Cuomo sent a memo to the New York State Department of Environmental Conservation (DEC) ordering them to release this draft, even though it was incomplete. “That draft was not available for public comment and it was missing the community and economic impact sections,” noted Mackenzie Schoonmaker, a staff attorney at Riverkeeper. On Sept. 7, the DEC released a fully revised Supplemental Generic Environmental Impact Statement (SGEIS) for public comment, which will end on Dec. 12. In the midst of this controversy, the DEC has also decided to create hydrofracking regulations. The DEC didn’t anticipate having to release these regulations on Sept. 28. Even though environmental groups wanted them to release the regulations, they did not want them released until after the SGEIS was complete. The comment period for these regulations will also end on Dec. 12.